This article first appeared in City & Country, The Edge Malaysia Weekly, on January 11, 2019 - January 17, 2019. I have never been one for camping. The thought of sleeping on hard ground, being attacked by insects and showering in cold river water is enough to make me curl up in front of the TV to watch documentaries on the great outdoors than being in the middle of it. 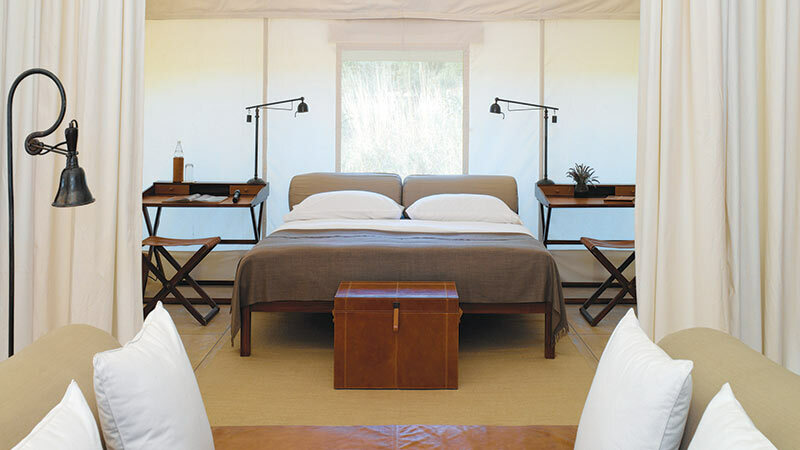 However, with the advent of glamping, the outdoorsy life does not sound so bad. Glamping or “glamourous camping” is not a new phenomenon. It provides a different experience for people like me who cannot do without our creature comforts. Here are a few glamping sites, mostly of the tent variety, although there are many types to choose from. So, explore your “wild” side while enjoying a delicious meal and sipping a beverage of your choice … without lifting a finger. 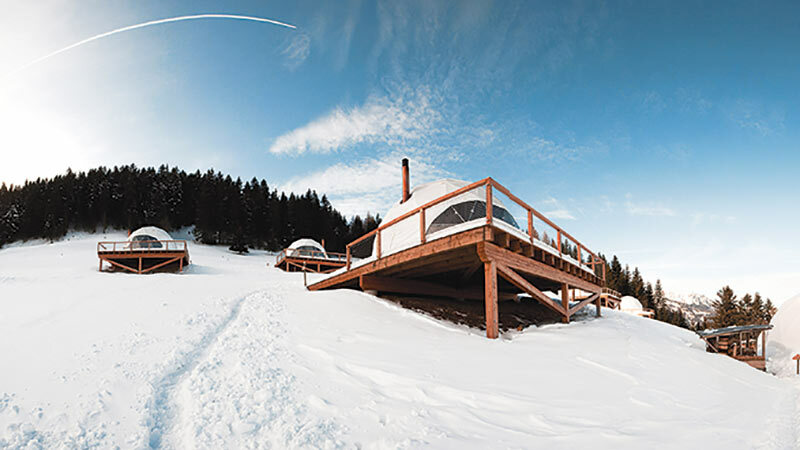 Sitting at an altitude of 1400m, Whitepod offers 18 pods — dome-shaped tents — that provide guests a connection with nature as well as all the comforts of a traditional hotel. Inside each pod are woodburning stoves, organic luxury bedding, bathrooms with shower and toilets and a large terrace with views of the Alps. Situated in Valais, Switzerland, Whitepod is an hour from Lausanne and 1½-hours’ drive from Geneva International Airport. Activities available include hiking with a certified mountain guide, paragliding and hiking with dogs — all allowing you to enjoy the natural surroundings. Moreover, this resort is very much into recycling and energy conservation. The summer season is from end-May to early-October while the winter season is from mid-December to mid-April. Rates for the summer season starts at CHF290 (RM1,223) while the winter season’s start at CHF450. This resort was opened in 2002 and offers guests 35 gers (handmade tents with a latticed wood construction and covered with layers of felt and canvas). Heated with a wood stove and furnished with hand-painted wood-framed king or double beds, each ger has a private bathroom equipped with a toilet, sink and shower. For an added touch, Mongolian felt slippers and bathrobes are also provided. Families are catered for with two family gers with two bedrooms linked by a bathroom. For activities, adventure buffs, naturalists and lovers of history can traverse the natural terrain by foot, mountain bike or 4x4 vehicle. There are also excursions on Bactrian camels. 2-night stay to a 5-day/4-night stay. The rates vary, depending on the number of guests staying. For instance, a 3-day/2-night stay package for four between July 5 and 20, 2019, costs US$2,535 per person. From June, July and August, it is US$2,185 per person and during May, September and October, it is US$2,125 per person. Visit threecamellodge.com for more details. Only 45 minutes from the city and situated at the foothills of Genting Highlands, Tiarasa is the brainchild of Malaysian director, producer and actress Puan Sri Tiara Jacquelina. Its tents have been designed to cater for families and couples as well as corporate retreats, weddings and special events. 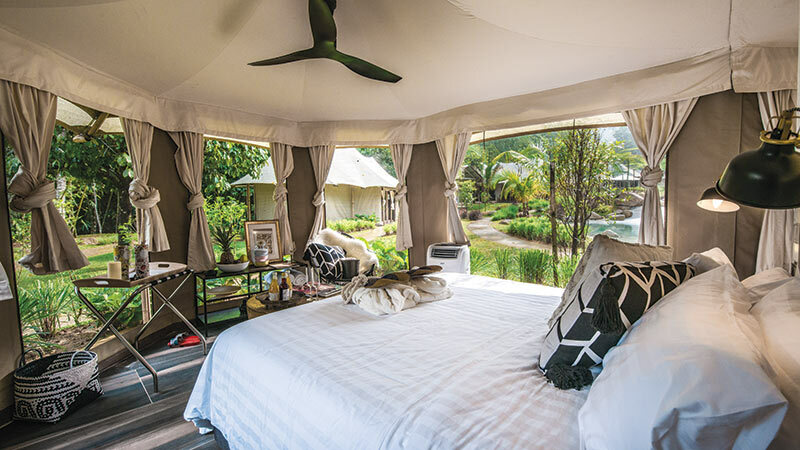 The 20 safari-style tented villas and five treetop villas have attached bathrooms, hot showers, deep-soaking bathtubs, air conditioning and free WiFi. Spread over seven acres, the glamping site has a slew of activities such as nature walks and moonlight cinema, as well as delicious food at Rasa in the Rainforest and The Red Dragonfly Poolside Café. You can also have picnics by the river. Room rates range from RM990 to RM2,000 per night. There are single and two-room options. Situated in the Aravalli Hills on the fringes of Ranthambore National Park, in rural Rajasthan, Aman-i- Khás offers ten beautifully furnished guest tents that each come with a personal butler. Six metres high with 108 sq m of space, each tent has a solid floor, hardwood and canvas walls, a sun deck, king-size or twin beds, a large daybed, a leather drinks chest, twin writing desks as well as dining, dressing and living areas. The bathing area includes a shower, stone soaking tub and separate toilet. The abode also comes with air conditioning, a ceiling fan and heating. Activities available include jeep safaris to see tigers and other wildlife, visits to the Ranthambore Fort and the Old City and camel rides for a leisurely look around. After a day out in the open, rejuvenate with a spa treatment or take a dip in the traditional step-well pool before dining at the fire pit under the stars. Aman-i-Khás welcomes guests between January and June and October and December. Prices start from US$1,000 (RM4,142) per night, including full board. This eco-safari destination is located at Unesco-designated Clayoquot Sound Biosphere Reserve and is near Tofino. Guests can only reach Clayoquot (pronounced: Clack-Watt) by seaplane, helicopter or boat, guaranteeing a remote holiday within a pristine environment. 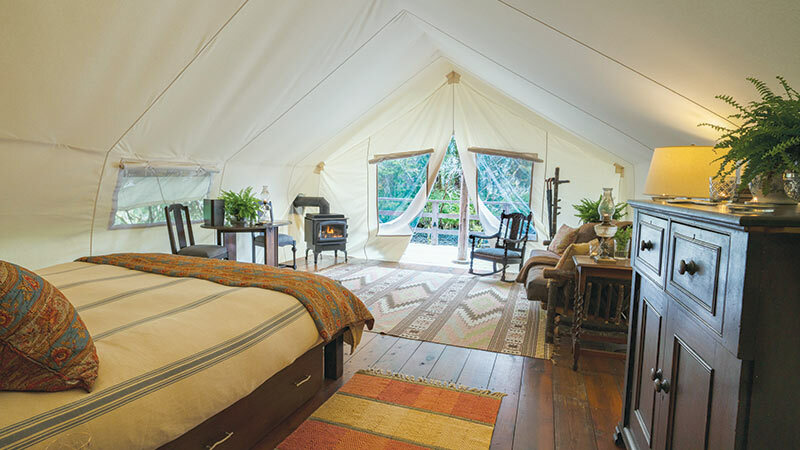 The 600-acre resort was opened in 2000 and features 25 canvas prospector-style tents providing comforts such as cast iron stoves, ensuite bathrooms with heated floors, private outdoor showers, antique furnishings and comfortable beds. Guests can participate in kayaking, hiking, heli-adventures or yoga. After all that activity, guests can enjoy a delicious meal or drink at The Cookhouse Dining Room, Ivanhoe Glass Lounge Bar or Bistro and Family Dining Tents. The resort offers several packages, starting with a 3-day package from C$4,500 (RM13,688) per person. “Another Mongolian glamping option?” you ask. Well this is not the average option available as their gers or tents are of the mobile variety. This option allows you to travel like the Mongol nomads did many decades ago. 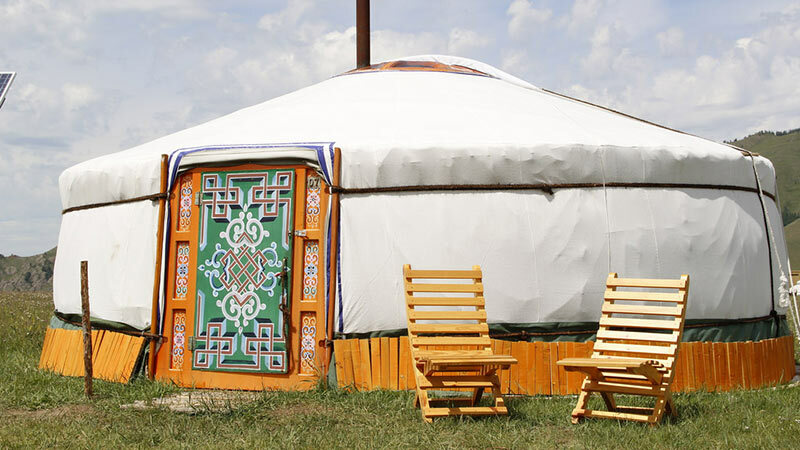 360° Mongolia provides bespoke tours around Mongolia, designed by Nomadic Journeys, which was established in 1993. With unobstructed views of the vast Mongolian landscape, guest will get to truly appreciate its rugged beauty. It is recommended that your group is made up of a maximum of seven guests so that you can fit into a Cessna Caravan for smooth transfers between camps. 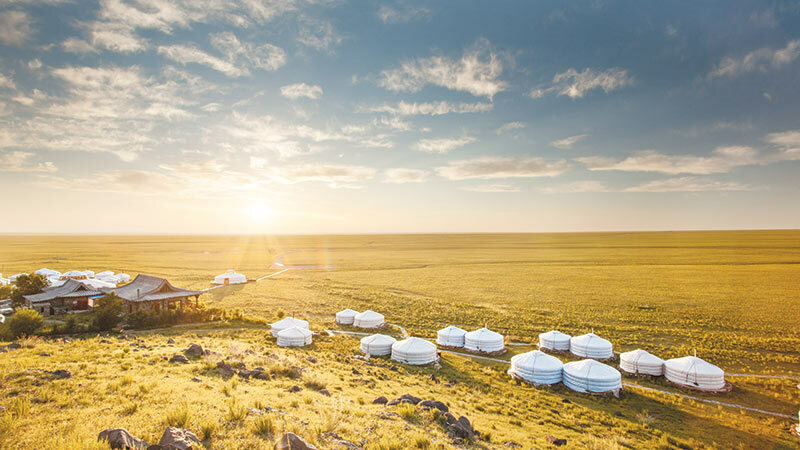 The glamping experience can be deployed to anywhere around Mongolia and it will cost at least US$500 per person per day. Fancy staying on the grounds of a medieval castle? 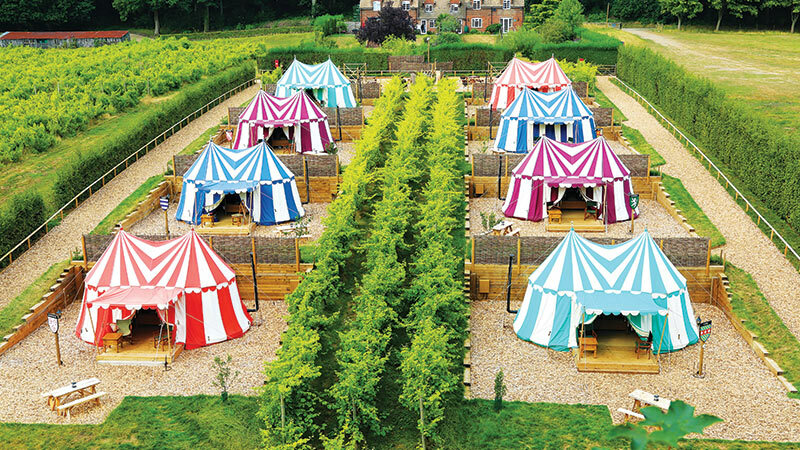 Well, look no further than the glamping tents behind the yew-tree maze at Leeds Castle. 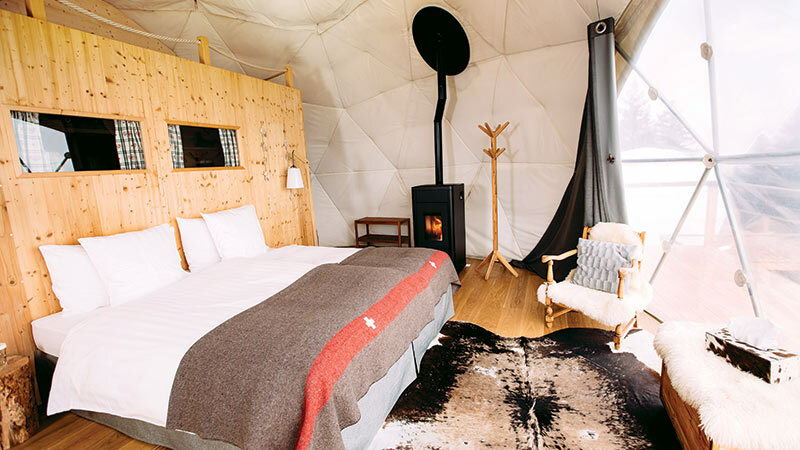 Although small, the quaint tents offer a four-poster bed, wood-burning stove, cotton bedding and furry throws. For shower and washing facilities, take a short stroll up a garden path to nearby Knight’s Cottage. The castle has been used as a Norman stronghold, the private property of six of England’s medieval queens, Henry VIII and his first wife Catherine of Aragon’s palace, a Jacobean country house, a Georgian mansion, an elegant early 20th- century retreat for the influential and famous and one of the most visited historic buildings in Britain today, according to its website. You also get free access to Leeds Castle and grounds during your entire stay. The tent rates vary, depending on the season, but generally range from £135 (RM710) to £360 per night.